The SUPERNOVA project was born in 2002 when Emiliano "EMIJAY" Nencioni & Giacomo "G.O.D.I" Godi met and, after separate and successfull careers in their own towns, decided to join and give birth to something global and ambitious. “AFTERBEACH”, their debut album released in 2003 is composed by 12 experimental tracks which range from Chill Out to melodic Techno. After obtaining several important approvals by music critics, many tracks were played by the Italian netwoks and were also requested to be included in famous compilations. The second album "DOWNTOWN UNDERGROUND", released by Sony Bmg in 2007 and characterized by several international collaborations ( i.e Grandmaster Melle Mel) and vintage inspirations, was immediately supported by Mtv and by the coolest critics, bringing SUPERNOVA to start several tours in China and the US. Form now on DOWNTOWN UNDERGROUND became also an itinerant party where Supernova are both creatore and Dj’s resident. 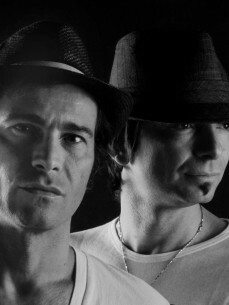 LAPSUS MUSIC, their label born in January 2009 is today considered as one of the most propositive independent label between the clubbing scene. In Italy they often play and work together with the most important clubs and recently they are more and more requested by the best international clubs. Their live dj sets showcases a blend of tech, funk and acid house, coming from their dj’s and musicians past careers transformed now into an exclusive sound which is a real style, their own brand. SUPERNOVA productions are always characterized by their personal atmosphere. Their powerful grooves, sounds and the original and eclectic style in finding arrangements, have now become a point of reference. SUPERNOVA music is released by some important labels like Lapsus Music, Defected, Great Stuff, Tronic, Bla Bla, Stereo Productions, Strictly Rhythm….